The last couple of posts have been about putting up a new section of fence primarily to direct traffic flow across the property; and about planting lemon grass as an edging directly below the cross-pole parts of the fence. Once the lemon grass has matured into big clumps, the fence won't be needed: the lemon grass will do what the fence does now. A few years ago, when we were still having to buy coconut trees to plant, I lined the 'avenida' (which goes across part of False Bluff) with the tallest coconut trees I could find locally. This roadway divides the dock part of the property from the part of the property that will eventually house small cabins facing the water. 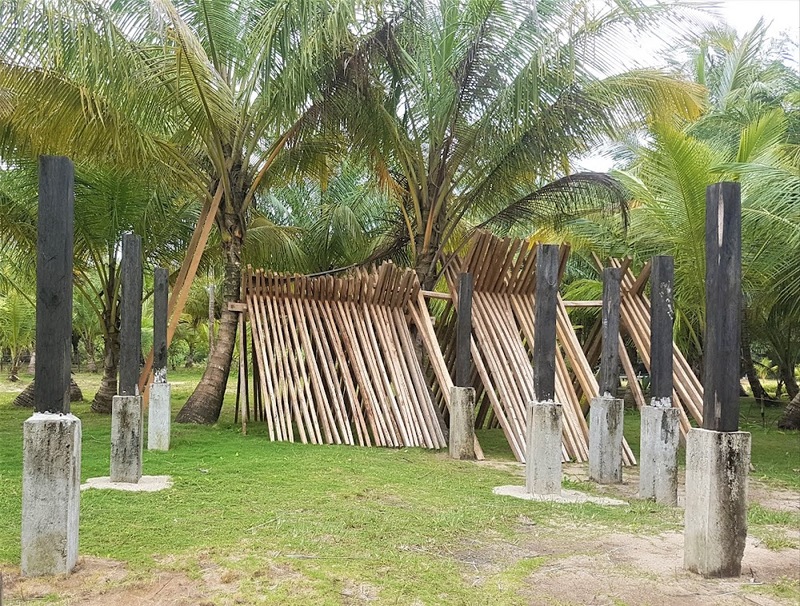 The new fence goes along one side of this roadway, directly in front of one of the two lines of coconut trees which edge it. And, of course, now lemon grass also lines the edge of the roadway where the fence is. So we have two lines of coconut trees which meander across part of the property, with a fence along one of the lines, and a row of lemon grass. Eventually, there will be tall coconut trees and low clumps of lemon grass. There's a shrub that's used for landscaping that I first saw in Bluefields. I found it growing wild at False Bluff and have no idea what its name is. It has glossy green leaves and bright yellow flowers - and once it gets big enough to bloom it doesn't stop. I rooted more than a hundred cuttings and the first ones I planted along the house in front of the kitchen - a year ago - are blooming. The ones between the coconut trees aren't quite there yet, but when they do begin to bloom they'll add a whole other dimension to the landscaping along the dock side of the roadway. NOTE: A reader identified this plant as 'Allamanda,' prolific in the tropics of Central and South America. Thanks Joe! There are three of these shrubs planted between each pair of coconut trees, just behind the lemon grass. So what we will have, again, eventually, are tall coconut trees, mid-size blooming shrubs and low clumps of lemon grass.